Preheat the oven to 350℉. Line a 9×9-inch baking pan with parchment paper, leaving a few inches overhanging on two sides to create a sling. I like to use binder clips to help hold the paper in place. Make the gingersnap crust: In a food processor, pulse together the gingersnap cookies and brown sugar until you have a coarse crumb. Add the ginger, cinnamon, and salt, and pulse once or twice to combine. Pour in the melted butter and pulse until combined. Spoon the crumbs into the prepared pan and use your fingers to gently press the mixture into an even layer on the bottom of the pan. Follow with the flat bottom of a measuring cup or glass to firmly pack the crust into the pan. Bake for 6-8 minutes, until the crust is just beginning to set, then remove from the oven and let cool for at least 10 minutes. Meanwhile, make the pumpkin filling: Heat the pumpkin, sugars, ginger, cinnamon, cloves and spices in a large heavy-bottomed pot over medium-heat. When the mixture begins to sputter, cook for 5 minutes, stirring regularly, until smooth and glossy. Remove from the heat and slowly stir in the condensed milk, whisking until completely combined. Whisk in the eggs and egg yolk, one at a time, whisking until completely combined after each addition. Stir in the vanilla. Pour the filling over the crust. Bake for 30 minutes, until the edges of the filling are just starting to set. Turn the oven down to 325℉, and bake for another 15-20 minutes, until the filling is mostly set (the center will still be slightly jiggly). The filling may bubble and puff up slightly as it cooks – that’s okay, it will settle as it cools. Remove from the oven and let cool for 2-3 hours until completely set. The pie filling will continue cooking through residual heat. 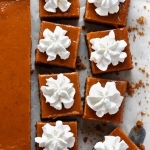 Garnish with fresh whipped cream and serve chilled or at room-temperature. Best eaten the day of, but will keep for 2-3 days in the refrigerator.